Frohe Weihnachten! Joyeux Noel! Vrolijk Kerstfeest! God Jul! Buon Natale! Feliz Navidad! I wish you a joyous holiday season and a serene, balanced and loving New Year! I'm taking time out to visit friends and extended family so posting on my blog will be sporadic in the next two weeks, but I very much look forward to another year of interacting with you, dear blog readers and friends, tons of fun and a giveaway or two! Happy holidays to you both (and Sammy) too! I hope you enjoy all of your mini trips on your staycation. See ya around soon! Merry Christmas to you, Sammy and all your family! Enjoy your time with friends and family! P.S. You are one cute Santa! Merry Christmas Duni! Have so much fun with your family and friends. Merry Christmas Duni, Tell Sammy that Duke and I hope he enjoys his holiday as well. May you enjoy a very Merry Christmas! Happy Holidays to you and yours as well! Enjoy the time out and the New Year! Hello Duni, Merry Xmas and Happy New Year! 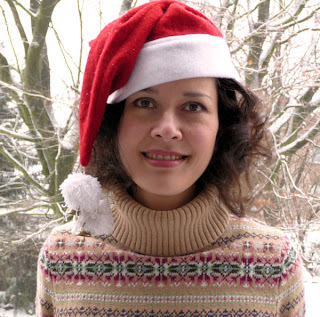 Hi Duni, you look lovely in your outfit and Santa's cap! Here is wishing you a blessed Christmas with your family! "happy xmas , happy new year"
Merry Christmas, Duni! Hope that all your hopes for the New Year come true in 2011! It's nice to be able to see your lovely face close up. I notice also that you seem to have a lot of snow, which is what we have too. Wishing you a blessed and peaceful holiday filled with love and happiness! Cajsa Cat says hello too! Tack för att Du skrev "God Jul" !! Have a Very Merry Christmas and enjoy the family. I know I will enjoy mine. Hope you have a wonderful time off!! A very Merry Christmas holiday and a happy New Year to you, dear lady! I hope you had a VERY merry Christmas and a wonderful time visiting your family. Happy New Year! Belated Merry Christmas. Love your photo. Had a 3-day off for Christmas, but spent lots of time visiting with families, and taking care of the grandbabies. Hubby and I have legal custody of them now. Have to work through the New Year, but will still have family get-togethers. We're under snowstorm conditions right now also. Haven't looked outside yet to see how much snow. Eight to twelve inches of snow was forecasted. Stay warm. Happy New Year!